Current Central Time now in USA and Canada. CST time now in USA. 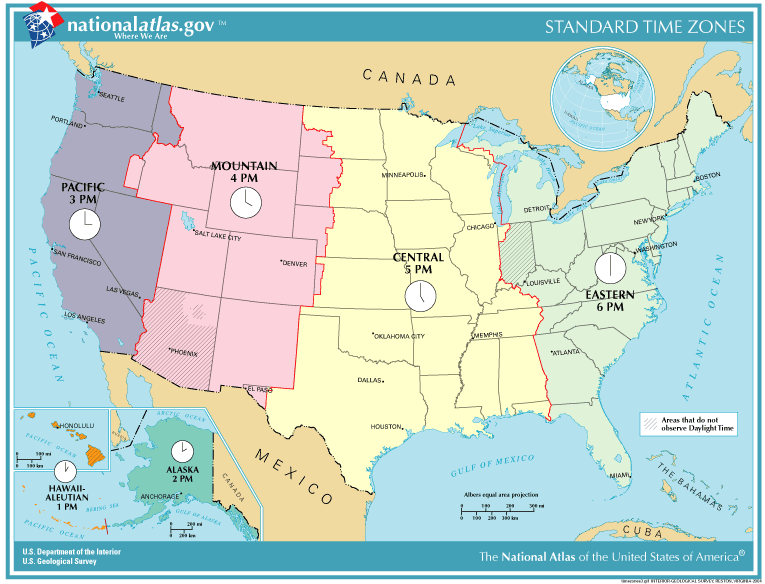 Time Zones in United States. In North America, Central Standard Time (CST) refers to a time which is followed in the Central Time Zone. CST means a standard time where six hours is subtracted from GMT (UTC/GMT −6), and during daylight saving time (DST), five hours is subtracted from GMT (UTC/GMT -5). The Central Standard Time is based on the mean solar time of the 90th meridian west of the Greenwich Observatory. Central Standard Time is observed during the winter months. While Central Daylight Time (CDT) is observed during daylight saving time in the spring, summer, and autumn months. There are areas which do not follow daylight saving time. In these areas Central Standard Time is observed year-around. In the United States and Canada, Central Standard Time is commonly shortened to Central Time (CT). Effective 2007, the local time changes from CST to CDT at 02:00 LST to 03:00 LDT on the second Sunday in March, and returns at 02:00 LDT to 01:00 LST on the first Sunday in November.